Grammy Award winning superstar Janet Jackson makes her big screen debut for Academy Award nominated Writer/Director John Singleton (Best Director & Best Writing, Screenplay Written Directly for the Screen, Boyz N the Hood, 1991) in the acclaimed and beloved romantic drama POETIC JUSTICE, newly remastered and debuting on Blu-ray February 5 from Sony Pictures Home Entertainment. Jackson, nominated for an Academy Award for Best Original Song for “Again” from the film, stars as Justice, a poetry-loving hairdresser on a road trip from South Central Los Angeles to Oakland with Lucky (legendary rapper Tupac Shakur, Juice). 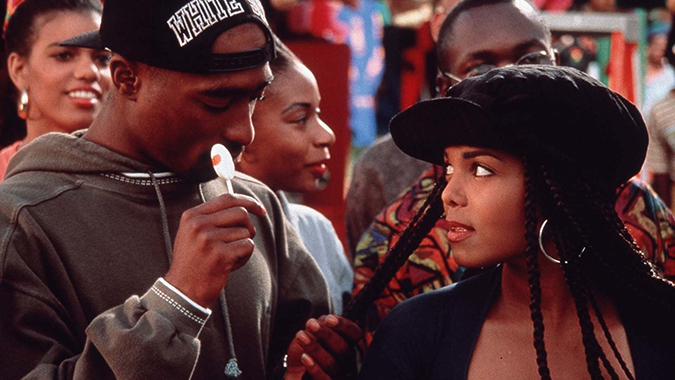 POETIC JUSTICE also stars Regina King (Ray), Joe Torry (Tales from the Hood), Lori Petty (A League of Their Own) and acclaimed poet Maya Angelou (How to Make an American Quilt), whose poems are featured in the film. Superstar Janet Jackson makes her stunning film debut in director John Singleton’s (Boyz N the Hood) street-smart love story, POETIC JUSTICE. A mismatched pair pushed together for a road trip from South Central L.A. to Oakland, Justice (Jackson) and Lucky (Tupac Shakur) have only one thing in common: they can’t stand each other. But as their friends Iesha and Chicago (Regina King and Joe Torry) fight –and makeup– in the back of the van, Justice, and Lucky find themselves reluctantly drawn together before being confronted once again by the shocking violence they thought they’d left behind. Featuring the music of Naughty by Nature and Tony! Toni! Tone!, and the poetry of Maya Angelou.